Ok yeah, we said they rule and they do, but finding a good way of arranging them into different shapes so we can create actual, solid light fixtures is tougher. You can use those colored six-wire cables but unless you enjoy creating a ball of Christmas lights out of these things, the cables don’t cut it either. This is about the moment we decided that if something didn’t exist out there to help us make the light fixtures we wanted, we would have to create our own solution. 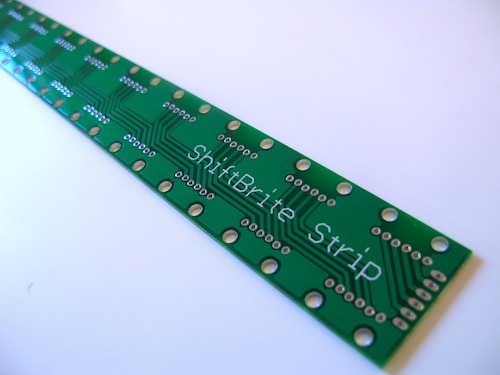 The ShiftBrite Strip is the answer to our woes. 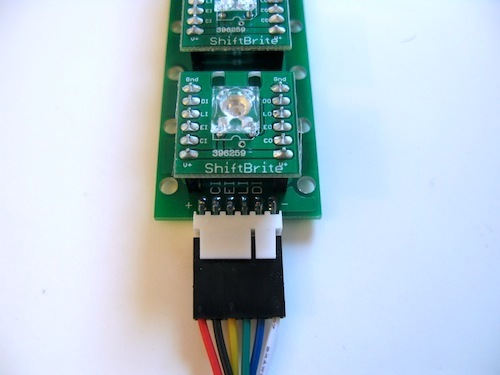 The ShiftBrite Strip is a custom circuit board that holds up to 12 ShiftBrite LEDs and functions in the same way as daisy chaining 12 ShiftBrites with the color six-wire cables from Macetech. The strips are 12 inches in length and can also be daisy chained themselves to create a stiff light fixture of any number of feet. 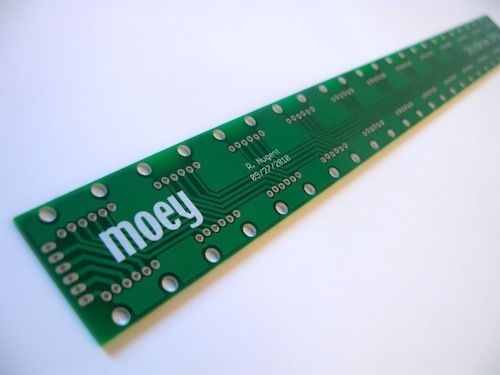 Each strip is littered with mounting holes to make it easy to mount to anything you’d like. 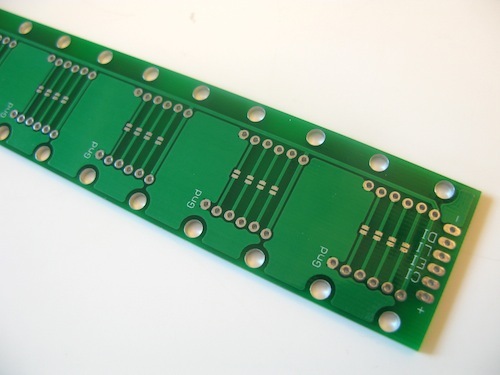 Each mounting hole is 0.125″ round and is located every 1/2″ starting a 1/4″ from either end of the board. The holes begin at 1/4″ because it allows the hole spacing to be consistent across strips. Each LED is located every 1″ starting a 1/2″ from either end of the board so lighting is consistent across boards as well. 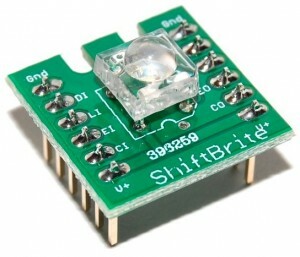 Under each ShiftBrite LED space are four solder jumpers. 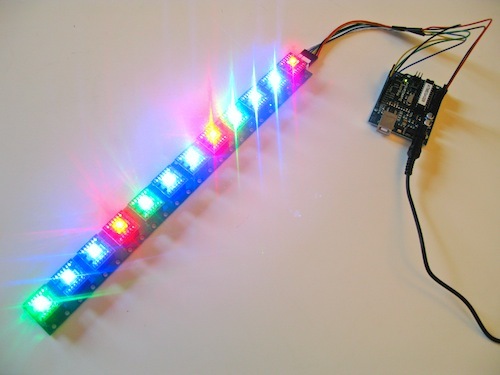 These jumpers allow for an arrangement of LEDs aside from the typical 12 in a row. 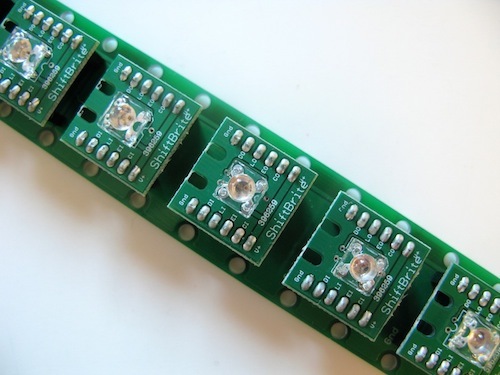 You can put 6 LEDs, one every other position, and connect the solder jumpers either with solder or a 0 ohm resistor to achieve a wider spread of LEDs.